Software agitation automatically generates a broad and varied set of test data to exercise the code with unprecedented coverage and thoroughness. 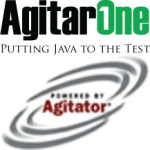 AgitarOne Agitator®is optimized for new code or “greenfi eld” applications. Enables interactive exploratory testing on your Java code, complementing your hand-written unit tests and helping you make sure your Java code works correctly. 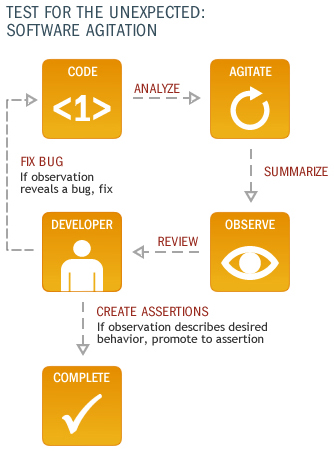 A developer can also manually create an assertion and validate that it is true in all cases. agitations verify all assertions and report success or failure. Developers can agitate their code frequently as they work on it, since agitation gives them near-instantaneous feedback on the code’s behavior. includes automated enforcement of Java code against a customizable set of rules, standards, and guidelines. includes built-in support for continuous integration and testing based on CruiseControl, the popular open-source solution.